Selkirk’s Incorporation of Hammermen are putting their members’ skills to the test by transforming a derelict building into a museum. 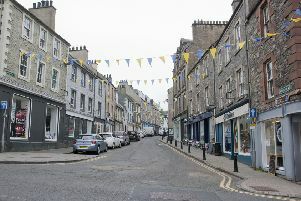 The building, in the town’s West Port, has been donated by one of the casting associaion’s members, who wishes to remain anonymous. And once the building – the entry to which is next door to Brown and Muir’s shop – is rebuilt from roof to floor, it will be used as a museum for the incorporation’s historic artefacts, as well as providing a meeting room for the entire community as and when required. Kevin Fairbairn, deacon of the Incorporation of Hammermen, said: “This is a very exciting venture for us. “There is a lot of work to be done – the roof will have to come off, and we are also looking at the possibility of putting in another access round the back to the car park – but we will be doing all the work ourselves. “We have applied for funding from the Selkirk Conservation Area Regeneration Scheme (CARS) project, and we are looking forward to possibly linking up with Halliwells’ House Museum close by. “But it will be a great wee place for other community groups or casting associations to hold coffee mornings in, or perhaps put on a display of their own. The group hosted a full launch of their plans for the building on Saturday, December 3, at the County Hotel, where interested parties were able to see what is being proposed. Mr Fairbairn said: “It was a fantastic turnout – we were delighted to see so many townsfolk who were interested in our project, people who could make use of the facility when it opens. “It was also good to welcome MSP Paul Wheelhouse and MP Calum Kerr, who both endorsed the project. “We are now just waiting for paperwork to be finalised and the funding to come through.